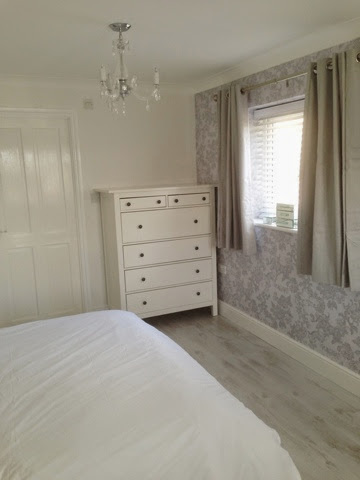 House Renovation – Bedroom – The Reveal! 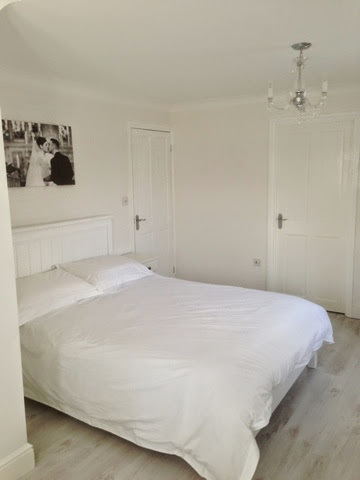 Here are the pictures of our finished bedroom. It does look quite bare, and I have put everything back into the room. We have so much storage now, everything has its own place, away from view! I’m sure once we have been living in here for a few weeks that bits and pieces will come out and worm there way onto my nice, clear surfaces. The wood floor was purchased online from floor maker. I think it was around £8 per meter. 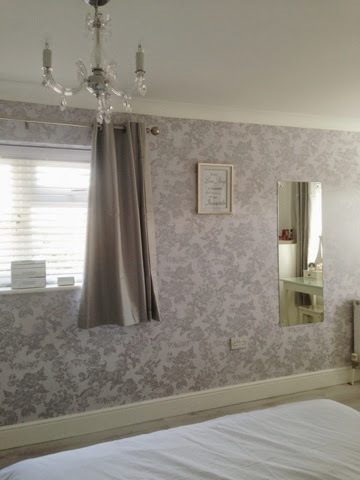 The curtains and curtain poles are from Dunelm Mill. The curtain poles were a bargain at £19.99. The curtains not so much. They were £49.99 and £54.99 for the two sizes we needed. We couldn’t scrimp on curtains as we needed black out curtains for when nick works nights and needs to sleep during the day. The blinds were purchased from 24/7 blinds. They are made to measure. I can’t remember how much these were exactly as we brought the ensuite blind at the same time. We plan to have these in every room of the house… Eventually! The Jewellery boxes on the window sill I have had for a while. These were a birthday present a few years ago. I think they were from marks and spencer’s. The mirror we were given from family. This was hung up in the room previously. The two chandeliers were purchased from Dunelm Mill quite a while ago now. Originally, these were going to go into the beauty room until I realised they would hang far too low. These were £29.99 each. 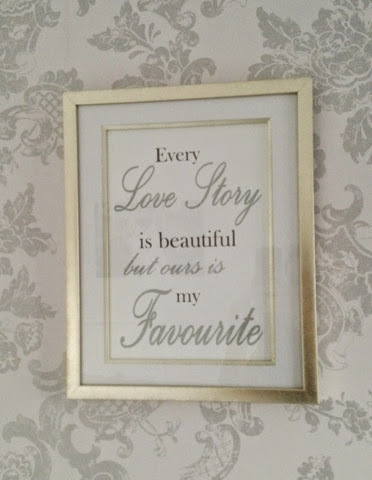 The lovely print hanging on the wall I made myself. Nick hates it but I love it and I made it and on the wall it shall stay! The chest of drawers is from Ikea. It was £140. This really is a beast! You can’t appreciate from the picture how large it is. Lots of drawer space in there. The bed was from Ebay, the make was Noa&Nani. It was £239.99. The bed linen is from sleep and soak and is gorgeous! The sheets are so soft and lovely. 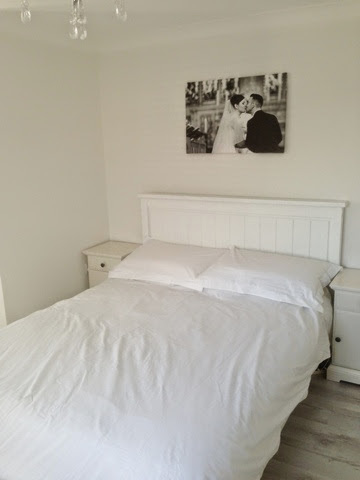 I bought all items separately and for the fitted sheet, duvet and 4 pillowcases I paid £62.00.The canvas above our bed is one of our wedding photos. The bedside tables were from Ikea. They weren’t in the Hemnes range like the chest of drawers and the dressing table as both bed sidetables in the Hemnes range were too big for the space we had. Instead we purchased these, the Birkeland bed side tables. They were £60 each. 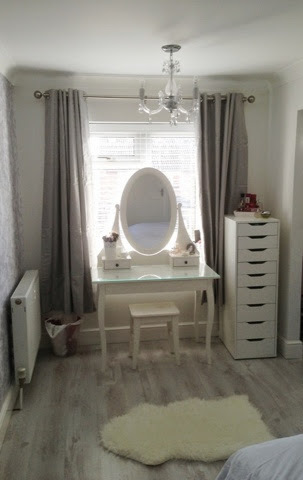 We changed the nobs to match the dressing table and chest of drawers and I think they match quite nicely. 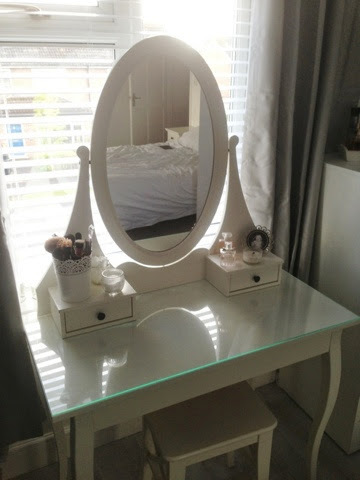 The dressing table is from Ikea, Hemnes range. It was £200. The drawer unit next to the dressing table houses all my jewellery, make up and hair bits. This was £90 and is from Ikea as well. The make-up brush pot on my dressing table is from Ikea, its from the gardening section. I have a larger one too for all my hair brushes and this sits on the window sill. The little glass pots housing my cotton pads and cotton buds are old candle pots from the 99p shop. On the other side I have my two favourite perfumes of the moment, a neom candle and a picture of my baby girl.A white wooden love heart tray from ebay sits on top of my Ikea alex unit with all my other perfumes in. I think that covers everything! If I have missed anything out and you want to know where it is from let me know. There are still a few more bits that I want to get. A new bin and a laundry basket. I’m thinking white wicker at the moment, probably from Ebay. I also want to get some throws and cushions for the bed and maybe some more fluffy rugs as ralph likes to sit on them (and is no longer allowed up on the bed!). All these are just finishing touches and they can wait. We have lots to be spending our money on in order to get the the rest of the house finished before the baby arrives! House Renovation – Bedroom Ensuite – The Reveal! I love the design of your bedroom. I'm looking for something similar to your flooring. May I be cheeky and asked where you got it from?